A common pet turtle, the red-eared slider doesn't require a great deal of care, but he does need a proper tank kept at the correct temperatures. If you thought this wasn't a long-lived species because you knew many with short life spans, think again. These turtles can live up to 75 years, but many do not. Keeping them at inadequate temperatures greatly affects their health and longevity. 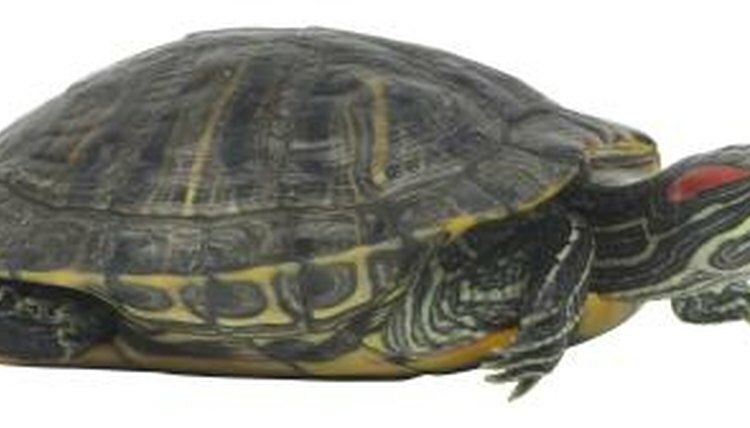 Your red-eared slider turtle requires a place to bask out of the water, consisting of wood or rock. That basking site must be kept at a constant temperature ranging between 85 and 92 degrees Fahrenheit. You don't need to purchase a special heat lamp for this purpose, as a regular lamp with an incandescent bulb of 75 watts or less will do the trick. Just make sure the turtle can't touch the bulb or that the lamp can't fall into the tank. If you keep your turtle's tank in a room in which the temperature is always at least 75 degrees Fahrenheit, you won't need a heating lamp other than for basking. The water temperature should also remain about 75 degrees Fahrenheit, so you should purchase a water heater and thermometer so you can always gauge the temperature. What Kind of Water Does an Aquatic Turtle Need?